Are these Telecom Dividends Safe? Do you like riddles? Let's try one on for size. CenturyLink reduced its dividend by 25% in February. The next day, its dividend yield had increased by nearly 25%. How did CenturyLink pull off that parlor trick? The answer is face-palmingly simple, as it usually is in these mind games. Investors expect a certain dividend income from this particular stock, and are quick to reduce the company's value to match dividend changes. In other words, share prices plunged through the basement floor overnight. 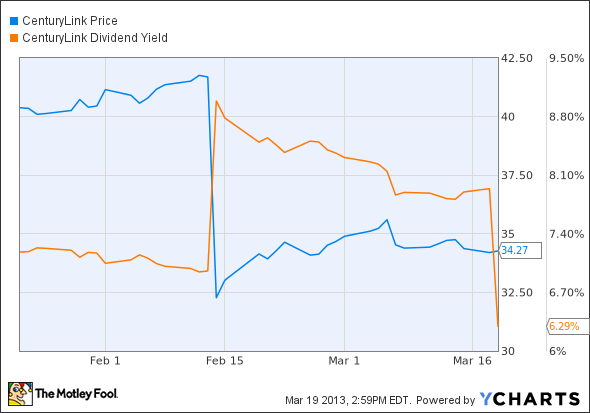 And now that the lower dividend has been paid once, the effective yield is lower than it was in early February. Damage has been done to shareholder value here, folks. Raw investor nerves also led to massive price drops in regional telecoms Windstream and Frontier Communications , even though neither company actually announced any dividend reductions. Is CenturyLink's penny-pinching a sign of worse to come across the entire industry? Telecom investors have seen a rash of slashed dividends lately. It's like watching a classic George Romero film, except that cash payouts have taken the place of Romero's beloved zombies. They're falling like flies. And it's not a uniquely American slasher flick, either. French telephony giant France Telecom cut its dividend twice over the last year or so, reducing payouts by a heart-stopping 74%. If you thought that was a scary move, consider that Spanish peer Telefonica hasn't paid a dividend at all since May. The policy is scheduled to restart in 2013, but this year's checks will only be about half as large as the ones distributed in 2011. Both France Telecom and Telefonica pinned their dividend cuts on capital preservation and heavy investment in next-generation network construction. CenturyLink's large price drop (and the domestic fallout over rivals Windstream and Frontier) shows that investors are nervous about similarly austere policies spreading stateside. After all, Europe and Latin America aren't the only places where telecoms are rolling out high-speed wireless networks amid brutal competition. Here's what I think: One size does not fit all. CenturyLink is rather unique. When it bought Qwest Communications, it came with a treasure chest of operating losses that are reducing CenturyLink's tax payments drastically. Those tax benefits will run out in 2014. Management didn't want to drive investors off a dividend cliff when that change plays out, so it took a modest dividend cut in 2013 instead. The end result should be a relatively smooth return to higher tax payments in the long run. Frontier also has a large, fairly recent acquisition under its belt -- but that one didn't come packaged with tax loss carryovers like CenturyLink's did. And WindStream's only significant buyout in recent years only carried a tiny $10.8 million tax benefit. From this perspective, CenturyLink was under far more pressure to protect its capital than either one of these peers. But that's far from the whole story. Have you seen how much cash CenturyLink is making these days -- and how stagnant the cash flows have become elsewhere in the industry? 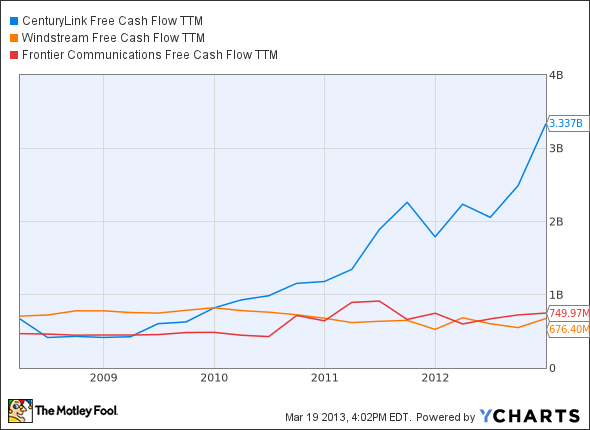 CTL Free Cash Flow TTM data by YCharts. And what it all boils down to is this: CenturyLink just swallowed a bitter pill in order to shield its shareholders from greater pain down the road, and Frontier made a similar move last year. That leaves WindStream as the most exposed regional telecom dividend, and in my book the most likely to take a chainsaw to its payouts any time soon. The other two megadividends seem reasonably safe for the next couple of years. CTL Cash Div. 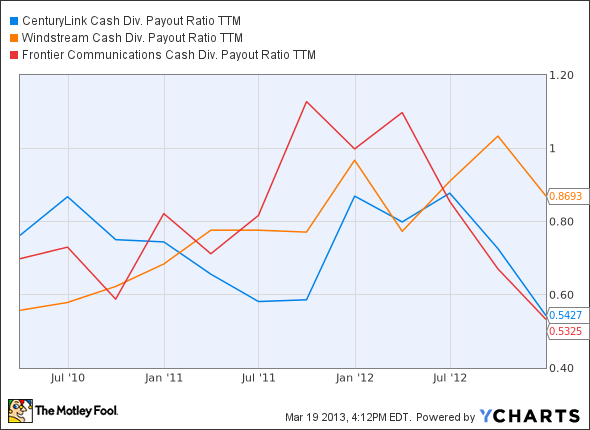 Payout Ratio TTM data by YCharts. That's why I just started a bullish CAPScall on CenturyLink. The pain of dividend reductions has already been priced into this stock, and the company remains a fabulous cash machine. When it comes to dividend yields, you won't find many higher than Frontier Communications. While its juicy dividend is tempting, every Frontier investor has to understand that it's not a sure thing. A huge acquisition has transformed the company forever. Will the move bear fruit, or are investors destined for another disappointing dividend cut? In this premium research report on Frontier Communications, we walk you through all of the key opportunities and threats facing the company. The article Are these Telecom Dividends Safe? originally appeared on Fool.com. Fool contributor Anders Bylund owns shares of France Telecom, but he holds no other position in any company mentioned. Check out Anders' bio and holdings or follow him on Twitter and Google+. The Motley Fool owns shares of France Telecom. Motley Fool newsletter services have recommended buying shares of France Telecom. The Motley Fool has a disclosure policy. We Fools may not all hold the same opinions, but we all believe that considering a diverse range of insights makes us better investors. Try any of our Foolish newsletter services free for 30 days.